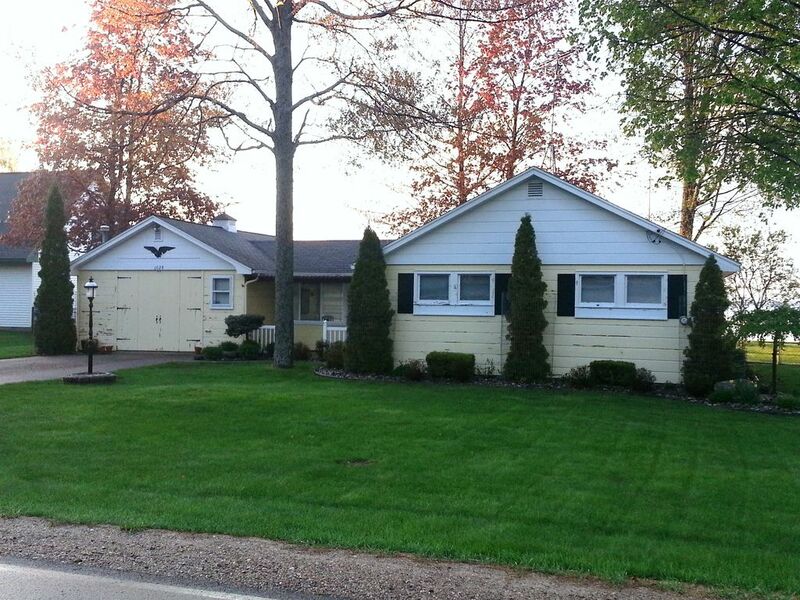 3 Bedroom, 1 Bath Lakefront Cottage on Michigan's largest inland lake! Over 100 feet of private frontage for our guests to enjoy and experience. "The Cub-Inn" sleeps up to 10 guests - Bedrooms 1 & 2 have queen beds, Bedroom 3 has a queen and a double, and there's a new sofa sleeper. We have a new fire pit outside / wood provided! Our cottage is less than 100 yards from a public boat access. The owners of "The Cub-Inn" were both born and raised in Houghton Lake, graduates of HLHS and professionals in the area. Our home is just around the corner from "The Cub-Inn" and we've always admired the property. Garage is converted into an additional gathering space and fish cleaning station with hot water. Outdoor and indoor board games. We have 2 kayaks w/ paddles available for you to use. Life vests as well. Bring your bikes, great neighborhood for riding. Fire pit with wood provided. Sand Box with a few sand toys. Schuffle board, Horse Shoes, Volleyball net and ball Concrete ramp for easy acess to water. Dock and Sandy lake bottom. We wanted a small house on Houghton Lake for three nights. This one was perfect! So retro it was fun, funky and definitely different. Super clean, well stocked, warm, comfy and convenient! Different review since I was unable to go last minute, but my buddies went and gave a great report. They told me it was clean, warm and everything was as expected so I was happy to hear that since I was the one who chose the house. Communication with the owner Steve was excellent and he answered all of my questions very quickly. The guys had a great stay and said they would stay there again in the future. Our four day stay couldn't have been better. The location is outstanding and being on the lake was such an enjoyable experience. The cabin is immaculate and the owners are such wonderful people and their communication was timely and accurate. I wouldn't hesitate at any time to rent the "Cub Inn" again. Thank You !!! Loved this place! The backyard on the water was amazing, especially with the fenced yard for the dogs. Our hosts were absolutely fabulous...really nice!! Loved all the stuff to do...kayaks, shuffleboard, fire pit, etc. Convenient to awesome pizza and a grocery store. Would definitely rent this place again! The property is very clean and nice. Our family of ten was fully accommodated at the Cub Inn! The kids and adults had a great time playing the many yard games after a beautiful day on the lake. Our only wish was to stay longer! Come see and enjoy Michigan's largest inland lake! Houghton Lake is known for incredible fishing and boating opportunities, as well as outdoor activities from sun up to sun down, for young and old. Our liberal ATV regulations will allow you to travel from your doorstep to hundreds of miles of trails, without the need for your trailer. If you would like to give SCUBA or snorkeling a try, the clear waters of Higgins Lake is only 15 minutes North.